Shell parakeets -- more commonly known as budgerigars or budgies -- are social and intelligent birds who need plenty of stimulation. Although they can be kept alone, if you work all day or you're frequently out of the house, keeping a pair is preferable. You need to introduce them carefully so they don't fight or become territorial. Before introducing your new budgie to your current one, it's a good idea to quarantine him. Even birds from a reputable breeder or pet store could carry a disease or parasites that would make your other bird ill. Treat your new budgie with a mite or louse spray and a medicine for internal parasites. Put him in a clean and sterilized cage in a separate room from your other bird, and keep him there for 30 days. If he shows no signs of illness and has no visible parasites in this time, then it's safe to introduce your budgies. Before letting your budgies loose to get acquainted, introduce them while they're both in their cages. Put their cages side by side so that they can see and get used to each other, without getting overexcited or territorial. Leave them next to each other for around a week, letting them out of their cages at separate times. Once your budgies have spent enough time next to each other, you're ready to introduce them outside of their cages. Let them both out into a secure room, so that they can interact on neutral territory. They need to sort out a pecking order between them, so expect a little bit of minor squabbling. However, if things get out of hand, separate the birds, put them back in their own cages and try again later. Rather than placing one bird into the other's cage and leaving them in there together, it's best to let your budgies pick their own home. Leave them out in the room in which you keep their cages, leaving the cage doors open. When they're ready to move in to the same cage, they should pick the one they prefer and both get in there by themselves. When this happens, you can remove the other cage and house them together. Although, keep a close eye on them the first few days they spend in the same cage to ensure they're getting along. 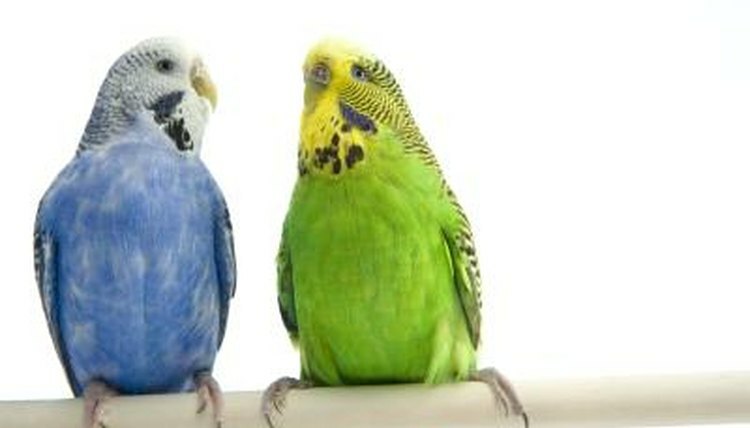 The Budgie and Parakeet Place: How Do I Introduce a New Budgie to My Current One/Flock?